A comprehensive guide to dyeing silk, wool, linen and cotton. Thousands of natural materials can produce glorious colour - the insect cochineal produces pink, maroon, and purple, and more than 500 species of plants produce indigo blue. Now, in The Modern Natural Dyer, expert Kristine Vejar shares the most user-friendly techniques for dyeing yarn, fabric, and finished goods at home with foraged and garden-raised dyestuffs as well as with convenient natural dye extracts. Demystifying the "magic," Vejar explains in explicit, easy-to-follow detail how to produce consistent, long-lasting color. 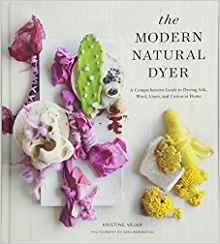 With stunning photography of the dyes themselves, the dyeing process, and 20 projects for home and wardrobe (some to knit, some to sew, and some just a matter of submerging a finished piece in a prepared bath), The Modern Natural Dyer is a complete resource for aspiring and experienced dye artisans.